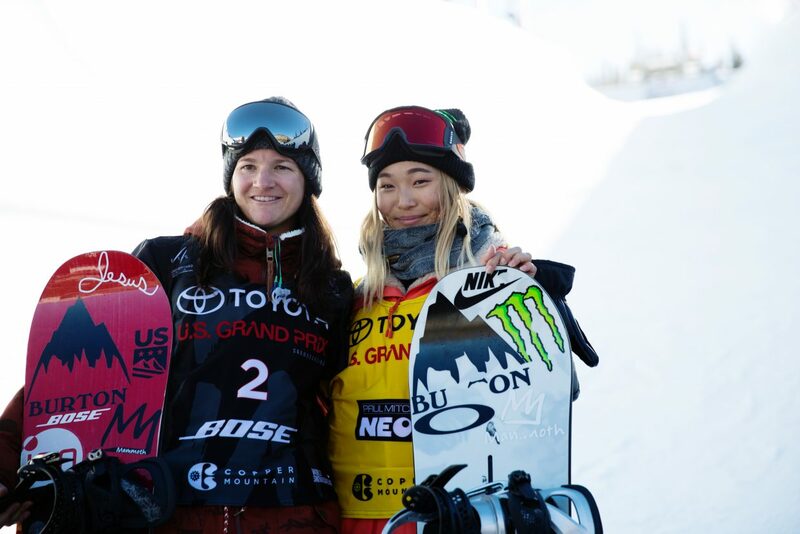 Kelly Clark, left, poses with Chloe Kim at the snowboard halfpipe finals in the 2017 Toyota U.S. Snowboarding Grand Prix at Copper, Colorado. Kim took the gold medal in the 2018 Olympics, while Clark finished fourth. Olympic champion Kelly Clark stood by a fence in the finish area, balaclava pulled up over her face, her head in her hands. A lineup of friends and fellow athletes came by to give her a hug. Few words were exchanged. Changing of the guard isn’t always easy. For 16 years, Kelly Clark has been the face of women’s snowboarding. And she likely will be for years to come — a rich legacy that has spawned a new generation of riders. Tuesday morning at Phoenix Sports Park in Pyeongchang, Clark showed, once again, that she’s a gamer. And a class act! Against a field of powerful women, Clark held her own putting herself into medal position once again. Four years earlier in Sochi, she persevered through crash after crash, finally winning bronze on her final ride. This time, she controlled the show from the start — landing each of her three runs, each successively better. What she couldn’t control were the young women she had mentored. Four years ago, Chloe Kim’s name was second on the Olympic qualifying list. Next to it was an asterik — * ineligible to compete due to age. She was just 13. Now, four years later, she became an Olympic champion in her ancestral homeland. Four years ago, Arielle Gold was on that Sochi team. It was a learning experience. Today, she’s an Olympic bronze medalist. Since winning Olympic gold at the age of 18 at the 2002 Olympics in Salt Lake City, Clark has embodied women’s snowboarding. Kim wasn’t even 2 years old yet. But along the way, as a precocious 8-year-old, she pulled on Clark’s jacket in Mammoth Mountain and asked to share a lift ride. Thus began her friendship. Over the span of five Olympics, Clark has won gold, bronze and bronze. Twice, now, she has finished fourth. And both times it came at the hands of a teammate and friend. What made Clark especially proud was the fact that she controlled her own destiny. Still it hurt. As she stood next to Chloe and Arielle at a team celebration, she reflected across one of the most storied careers any Olympian could enjoy. Each Team USA medalist is given a unique opportunity to recognize a coach or mentor who made a difference for them — the Order of Ikkos award named after an ancient Grecian athlete and first coach. Chloe chose Kelly. Kelly, thanks for sharing your dream.